This three strand necklace is made of a mix of grey beads and tubes, peacock colored freshwater pearls, citrine tinted quartz and 6 mm round cantaloupe swarovzki crystals. What I find interesting is that the cantaloupe crystals only look green at night under artificial light. This three strand necklace is more stunning than the picture portrays! 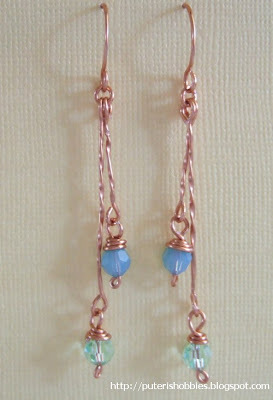 The findings of these ear-rings are made of copper and are hand-made. The crystal rondelles are peridot. 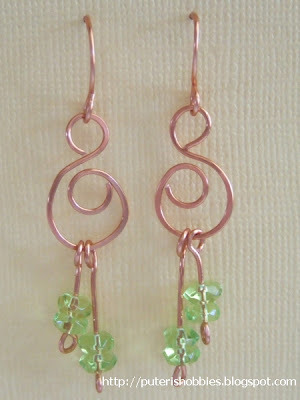 Twisted copper links and swarovski crystals make up this dangle ear-rings.